12/2004. Robin Brailsford, lead artist, with David Angelo, architect. Lincoln Park, Los Angeles. World's first memorial for Latinos who have died of AIDS, 500,000. 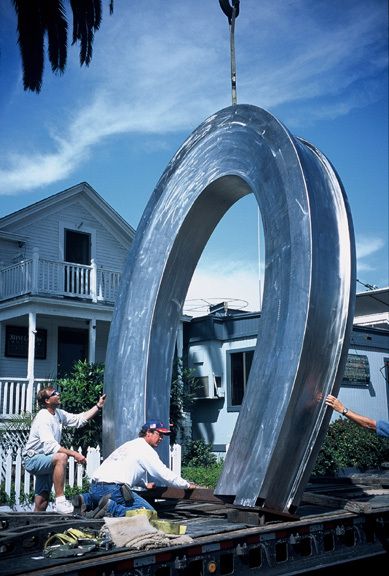 The project's main sculptural icon, fabricated of stainless steel, and seen here being readied to ship from San Diego to Los Angeles, symbolizes the AIDS ribbon. The sculpture is fabricated by Thomas Marine. Photo courtesy of Robin Brailsford.